Let me introduce you to my latest creation: Baked Vegan Cheesecake! I really do like raw vegan cheesecake but all the raw vegan cheesecake in the world will never get close to the cheesecake that my mum used to make: a baked one! This used to be my favourite of all cakes and I remember that my mum made one every year on my birthday – a simply special treat! And what would be a better reason to share the secret to the perfect vegan Baked Cheesecake Recipe with you than the Great Vegan Baked Cheesecake Recipe Off 2017?! 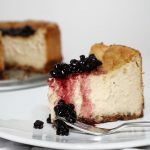 I’m happy to share the recipe to such a scrumptious cake like this Baked Vegan Cheesecake – and there might be an ingredient in the list that might truly surprise you – but please have trust: this cake tastes absolutely phenomenal! 1. Place the gluten-free rolled oats in a food processor and pulse until it resembles a flour. Add in the ground almonds and pulse 2 more times to combine. 2. Puree the dates with a stick blender and add to the oat/almond mixture. Add the water and combine everything well until you have a sticky mixture. 3. Oil a round cake tin with coconut oil and press the oat/almond mixture into the bottom of the tin. Press it down gently, but firmly, then place the cake tin in the fridge until you have prepared the rest of the ingredients. 4. Preheat the oven to 180 degrees. 5. To prepare the filling add all ingredients to a blender and mix until smooth. 6. Remove the cake tin from the fridge and pour the filling in. 7. Place in the oven and bake for 15 minutes, then reduce the heat to 160 degrees and bake for another 30-35 minutes. Make sure to turn the cake slightly every 15 minutes, so that it browns evenly. Once your cheesecake is ready, let it cool down and place it in the fridge if you don’t plan to enjoy it right away. 8. To prepare the topping simply add your frozen berries to a saucepan and heat, add in the cinnamon and cook on low heat until the liquid reduces. 9. 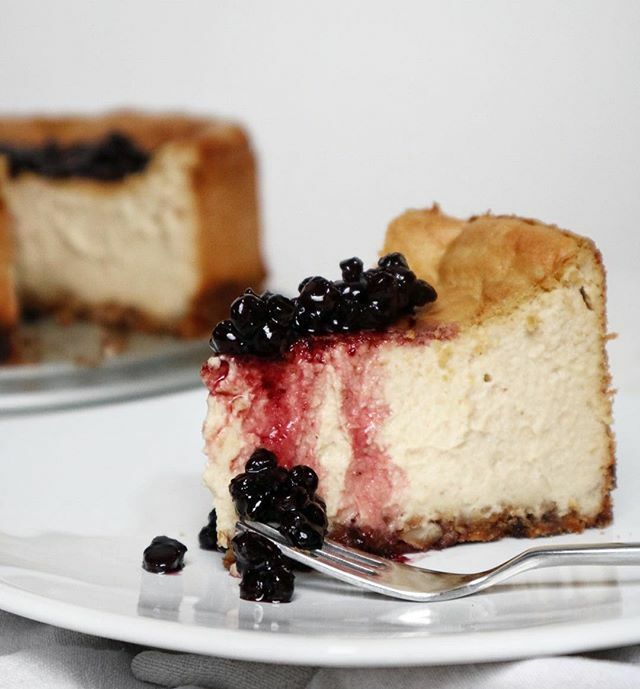 Pour the berry mix onto the cheesecake, cut into slices and enjoy with friends and family! Looking for more vegan bakes? Make sure to check out the Cakes & Bakes Section!